How true this is. 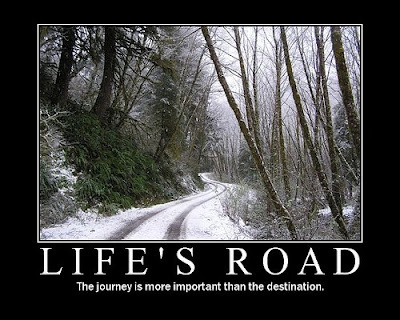 But sometimes knowing where the journey ends is important, too. I have a lot of things to think about these days. Finding the best fat burner is not one of them. Boy, talk about some major ups and downs, girl! You sure have had 'em going on this week, haven't you? Just wondering here too -but do you know if they offer any programs up your way that are geared to helping "displaced homemakers" primarily in job search and training stuff? Also, you know with your past mental health history, you might be able to get assistance through the Office of Vocational Rehabilitation too. Might be worth looking into no matter how things shake out. The "displaced homemaker" program here is called "New Choices" and it's been around for over 20 years now -pretty decent program too and I think quite possibly it is one that is done with federal funding so there's a good chance there might be one in your area. Drop and e-mail if you want to talk -or you can also catch me on messenger -either AIM or Yahoo -Jenihill or Jenihill1 -respectively.